Auto hiding of taskbar in windows is a useful feature, if you are working on something important and want more screen space for the application. For example you are designing a new power point or you are reading an important piece of article on browser and you want a distraction free environment. In this case its better if you set windows 10 taskbar in auto hide mode. Auto hide mode does not completely hide the taskbar. It scrolls up and shows up whenever you take a mouse cursor in taskbar area. Also, start key can always be accessed by pressing windows key on your keyboard. Now, let us summarize how is it done in simple steps. Step 1 – Just do a right click on anywhere on an empty space on taskbar . 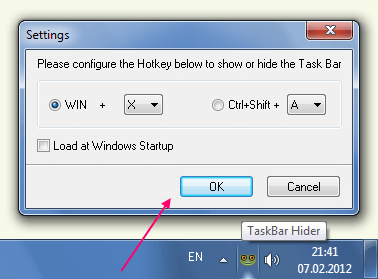 Step 2 – Click on Taskbar Settings. Step 3 – In the right side, Just Toogle On the option saying Automatically hide the Taskbar in Desktop mode. 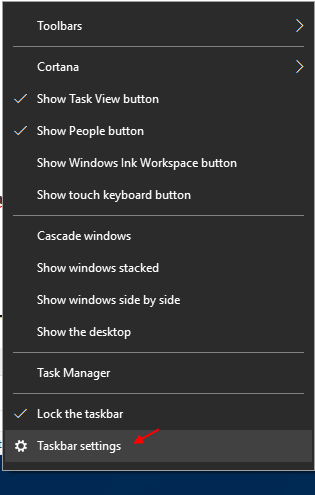 To revert back this feature, just follow the same route and uncheck the option saying auto-hide the taskbar. What if you do not want the taskbar to appear even when you hover the mouse on it. what if you just hide the taskbar show it when needed with a hotkey. There is no specific setting tweak for it, but you can easily do it via a free utility named Taskbar Hider. Just download and run it. Whenver you will press windows key + x, the taskbar will disappear. Press windows key + x again to show it. You can change the Keyboard shortcut by right clicking on it and choosing setting and then setting up your own hotkey.